So, I'm working to build a gravel bike using a Niner MTB frame. I have a Shimano SLX 2X (675) crank and want to run it with 44t and 28t chainrings. The SLX is a 110/64 BCD. I can't seem to locate any 44 rings that are recessed in the rear...only the front. I screwed up my own post. The crank is a 104/64 BCD...not 110 as stated in my original posts. Thanks! 36 is about the biggest 104BCD ring that you can find as a middle. If You are looking for something on a budget, I would go to the Community Cycling Center on Alberta and see if they have a older road triple crankset. You can take off the ridiculous 54t outer and use the crank as-is and it should be about the gearing that you are looking for. The other option is a mountain double that you can find in a 28-38, but you will probably only find new. 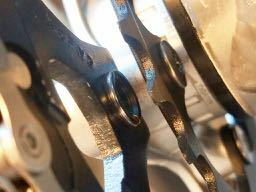 SO.. maybe you actually need a 110 - 74 crank, after all, if a 104/64 BCD 44t is only manufactured as an outer chainring..
Can you add the countersink yourself? Hmmm... tough to find the right tool to do a good flat bottom counterbore. One might be able to modify one of these to do a 10mm x 12mm counterbore. (verify size). One might be able to do it with a 12mm endmill without a guide, but then it would have to be centered perfectly. Use depth limiter on drill press/mill, or set table to limit depth. I see the issue with using the outer ring in the middle ring position. I thought your rings were without a recess, but it is on the wrong side. I have thought about whether it would be possible to counterbore a recess into the rings, but the remaining material could get mighty thin. You might be able to grind off part of the bolt heads so they wouldn't interfere, or use a slightly larger small ring. Looking at rings. You might try a "Flat" ring that should be reversible. For example the Vuelta Flat rings. Unfortunately I'm not seeing photos of both sides. Or, try a different crankset. Bikes: 1974 PX-10E sold, 1977 Witcomb stolen, 1980 Roberts 1 speed, 1987 Cyclops 3 x 6 friction, 2010 Masi Commuter 1 speed, 2017 Ribble 525 2 x 10 Ergos, un-ashamed of my triple crank. I think Zicral is 7071-T something, and I suspect the supplier is Stronglight. They can fix you up with TA as well, and they are the best rings, period.